Chou Yu-Cheng, From Geoff Molyneux Series, 2014. Acrylic on canvas, installation. © Chou Yu-Cheng. Courtesy Chou Yu-Cheng and Edouard Malingue Gallery. Chou Yu-Cheng specialises in the interplay between aesthetics and society. His practice place a conceptual emphasis on the procedure and operations behind his projects in their specific contexts, reflecting on the problems of reality and proffering alternatives to their corresponding benefits, organisations and histories. As a conceptual artist Yu-Cheng is concerned with the systems and mechanisms of the art world. 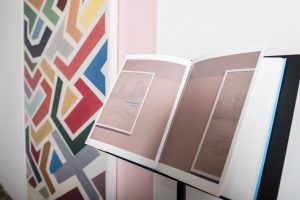 Acting as an intermediary, much of his work engages with institutions, art’s histories, and audiences, and not only seeks to reinterpret how and why artworks are displayed, but also to intervene in the gallery space itself. Chou’s from Geoff Molyneux Series, is a response to work by the Manchester-based painter Geoff Molyneux (b.1951) who Chou met when on residency at Centre for Chinese Contemporary Art (CFCCA) in 2013. 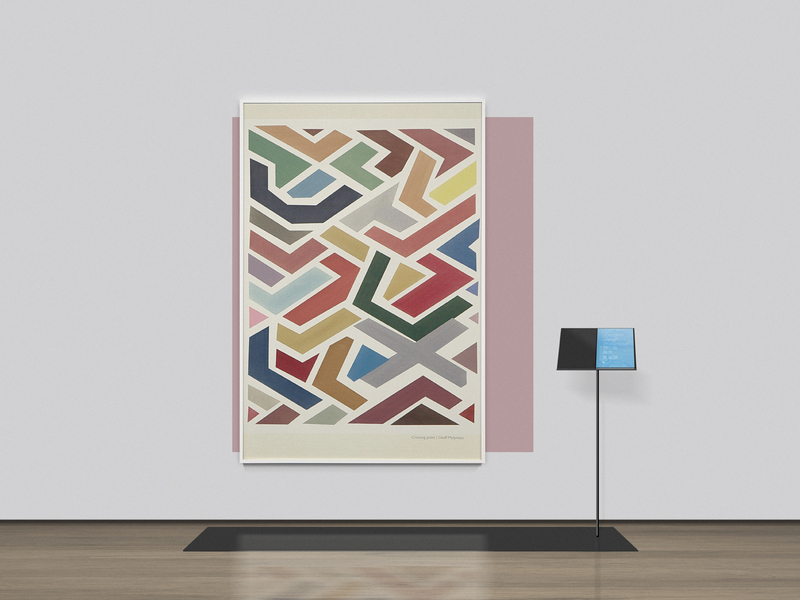 Chou plays with Molyneux’s abstract geometric painting, including repeating a particular colour used on the canvas as a background. 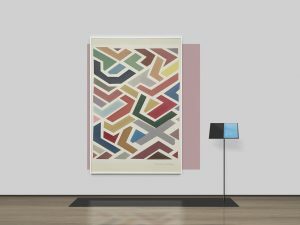 In this display, Molyneux’s original painting is divorced from the time and place in which it was made – and cumulatively Chou proposes how the mechanisms for the display and contextualization of art may be questioned. Chou Yu-Cheng, from Geoff Molyneux Series. PRESENCE exhibition installation shot by Pete Carr. Chou Yu-Cheng studied at l’Ecole Nationale Superieure des Beaux-arts de Paris. He has exhibited widely across the world and recent solo shows include exhibitions at Museum of Contemporary Art Denver, Colorado; Galerie Collet Park, Paris; Taipei Fine Art Museum, Taipei; Kaohsiung Fine Art Museum, Kaohsiung and Edouard Malingue Gallery, Hong Kong. Group exhibitions include: PRESENCE: A Window into Chinese Contemporary Art, Liverpool, UK (2018); Share, Create, Unite, The Physics Room, Christchurch, New Zealand (2017); Tropical Cyclone, Kuandu Museum, Taipei, Taiwan (2017); What’s in Store?, Salford Museum & Art Gallery, Manchester, UK (2017); Art, Ask About Asia, Daegu Art Factory, Daegu, Korea (2017); Asian Art Biennial, National Taiwan Museum of Fine Arts (2015); The Great Ephemeral, New Museum, New York, USA (2015); Queens International 2013, Queens Museum, New York, USA (2013); Aerobraking, Pier 2, Kaohsiung, Taiwan; Taipei Biennial 2012, Taipei Fine Art Museum (2012).